Not only do members of the Wholesale Beer & Wine Association of Ohio rely on Mickey Truck Bodies to help deliver their beverages within their respective markets, they can also count on Mickey to deliver cold liquid refreshment while they are swinging away on the golf course. 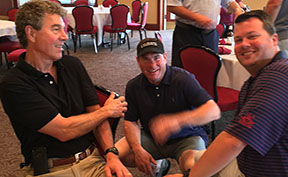 Mickey teed it up again at the WBWAO’s annual Summer Meeting & Golf Outing held recently in Dayton, OH by sponsoring the ever-popular “beverage cart.” But to be sure, Mickey was just as popular on the meeting floor as it was on the links. Joe Schetz is flanked by Tim Bechtold (left) and Jacob Evans, both with the WBWAO. Joe Schetz, VP Operations & Finance for Northwood, OH-based NWO Beverage Inc., a Miller/Coors wholesaler with a host of craft brews and non-alcoholic drinks, was one of the attendees grateful for the Mickey beverage cart during a hot and humid round of golf, and even more appreciative of Mickey’s quality products and superior service. NWO entered the Ohio market in 2008 via acquisition, and in the process acquired 25 beverage trailers, excluding bulk vans and the special event trailers, 14 of which were Mickey units between 7 and 27 years old. Since the acquisition NWO purchased four new Mickey trailers from Steve and one refurbished trailer from Mike Parker, General Manager of Mickey’s Midwest Reconditioning & Service Center in Bloomington, IL.